Zoosk boasts one of the largest member bases of all dating sites in North America and yet it manages to create a personalized, unique dating experience for each and every one of its members. Zoosk’s secret to online dating success has two main components - a fresh, intuitive dating site, fully integrated with social media and Zoosk’s Behavioral Matchmaking™ system, which updates users’ matches based on their constantly evolving preferences. Zoosk strives to constantly send all of their online daters compatible matches because they believe that no online dater should be stuck sifting through millions of irrelevant dating profiles. 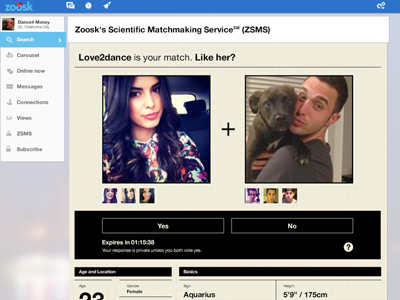 Zoosk’s Behavioral Matchmaking™ technology has revolutionized online dating. The unique engine follows each dater’s searching habits, takes notes of preferences and trends and adjusts their suggested matches accordingly. The matchmaking feature pays close attention to messages sent, replies sent, and profiles viewed. Another one of a kind feature in the online dating world, is the unique way that Zoosk now verify photos on profiles. Using your mobile phone, upload a seven second ‘selfie video’ and a human representative will compare this to the photos on your profile and mark you as verified. This has drastically reduced fake profiles and allows you to chat and meet up with much more confidence than on any other online dating website. Zoosk’s award-winning mobile app has been deemed the #1 Dating App worldwide and is one of the Apple App Store’s top 10 grossing apps. Zoosk leads the mobile dating world, with users logging on to find live in over 25 languages across 70 countries. This feature lets users comfortably flip through various potential matches that Zoosk’s Behavioral Matchmaking™ engine has suggested for them. The dynamic feature updates constantly as it tracks daters’ preferences and search habits. Zoosk members can take the search for love into their own hands by choosing from thousands of search terms and filtering options to find potential matches. 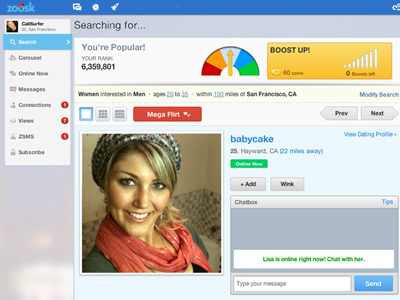 Search for matches based on religion, lifestyle, age, location, and social habits in Zoosk’s expansive search section. Zoosk users eagerly await the profile sent to them daily from the ZSMS. These matches, sent once every 24 hours, are carefully selected according to each dater’s preferences, messages, and clicking habits. If both potential matches click “Like”, ZSMS will introduce the two daters. 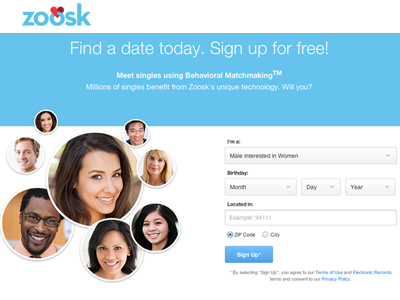 Once signed up for Zoosk, users can immediately begin browsing for free. In fact, daters can take advantage of Zoosk’s Behavioral Matchmaking™ technology and search on their own without paying a dime. Once they find member who pique their interest, they are encouraged to sign up for one of Zoosk’s many membership options in order to start taking advantage of Zoosk’s messaging services. The makers of Zoosk take pride in keeping safety standards high. Every time a new member joins the site, a Zoosk representative reviews and verifies their profile details by reading their text thoroughly and running identity checks. These can be done by social media or phone, and now also by video verification, an option not offered anywhere else. Zoosk also offers users the option to browse privately, ensuring that their details are 100% protected. 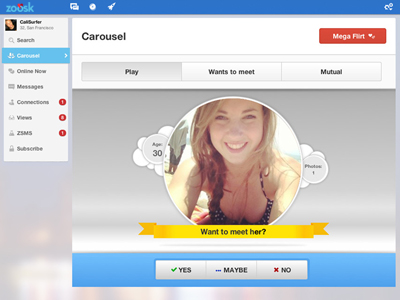 Anyone can sign up for Zoosk for free, browse site users and send messages. It is only once a match has been made and the two daters would like to communicate that users are prompted to sign up for a paid membership. Once a paid subscriber, members are given access to all messaging and chatting options, see who has viewed their profile and take advantage of the ZSMS features. Zoosk also offers its members the option to purchase coins, which can be used to boost visibility in search results, send gifts and use premium messaging features. Free Basic Membership 0! 0! With millions of users in over 70 countries, it is no wonder why Zoosk has a section dedicated to the site’s success stories. 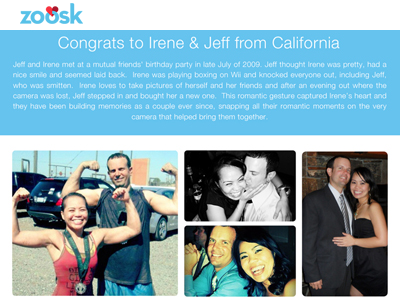 Read couples’ testimonials see first-hand how Zoosk’s mission to empower singles to find fulfilling love has worldwide. Combining top-notch matchmaking services and state-of-the-art technology has helped Zoosk stay at the forefront of the online dating world. It is clear that Zoosk offers simultaneously its users a great value, a fun and interactive user experience and excellent chances of finding love.